Mr. Chairman; 5. It is gratifying to note that our Union has made laudable progress over the past one and a half decades since its transformation from the Organization of African Unity (OAU) to the African Union (AU). Notably, we have been able to redirect our priorities at the continental level from mainly political goals to more diverse aspirations that are equally fundamental to our survival and development in a global community. 6. It is however clear, Mr. Chairman, that some of the greater challenges to our peoples within this Union still lie in the political, economic, as well as peace and security spheres. Our continent is currently bedeviled by the twin evils of terrorism and insecurity; poverty, youth unemployment, and underdevelopment. The destructive effects of the inhuman and criminal campaigns of the Boko Haram insurgency in Nigeria and neighboring countries; the Al-Shabab attacks in East Africa, and the activities of the Al-Qaida in the Maghreb, all bear testimony to a continent under siege. Mr Chairman, Excellencies and Colleagues; 7. On our part, I was convinced on my assumption of office that the best approach would be to work within the framework of the Lake Chad Basin Commission (LCBC) to mobilse collective support to fight against Boko Haram. I have in this regard, directed the relocation of Nigeria’s Command Centre to place it closer to the theater of action. Furthermore, I have vigorously engaged the members states of the LCBC to better coordinate the strategies and tactics in fighting the insurgency in the region. I believe that this approach can be enhanced through complimentary regional and continental efforts. 8. The images in the international mass media of African youths getting drowned in the Mediterranean sea on their illegal attempts, and often times illusory hope of attaining better life in Europe is not only an embarrassment to us as leaders, but dehumanises our persons. Indeed, they combine to paint a very unfavourable picture of our peoples and countries. 9. Those of us gathered here today owe it as a duty to reverse this ugly trend. We must put an end to the so-called push factors that compel our young men and women to throw caution to the winds and risk life, limbs and all, on this dangerous adventure. We must redouble our efforts to sustain the economic development of our countries, ensure empowerment of our youths, create more jobs, improve and upgrade our infrastructure, and above all continue the enthronement of a regime of democracy, good governance and respect for human rights and rule of law. These and other measures that engender peace and stability must be pursued relentlessly. 10. In this connection, we must persist in our collective endeavour to work together through the African Union and our respective Regional Economic Communities (RECs), to uplift our continent and provide the African peoples the enabling environment for the realization of their legitimate dreams and aspirations. At this juncture, let me assure you of the unflinching commitment of Nigeria to the ideals and aspirations of the African Union as explained in the Agenda 2063, which is geared towards ensuring a peaceful, prosperous and integrated Africa in the next 50 years. It is for this reason that Nigeria is fully and irrevocably committed to the ECOWAS vision. 11. We do so because we believe that African integration is best attained through the instrumentality of our Regional Economic Communities (RECs) as the building blocs of viable continental institutions. 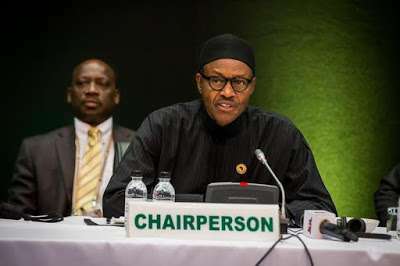 Nigeria will therefore continue to play her part in supporting the African Union Commission and other continental and regional institutions in their efforts to prioritize African development in all sectors of human endeavour. 12. The journey might look arduous, but certainly not impossible. There are opportunities in every challenge. If and when we adopt this call for a change of attitude, approach, and disposition towards agreed protocols and commitments, we shall be bequeathing a politically stable, economically developed, and socially harmonious Africa, thereby justifying the confidence reposed in us by our electorates. We will also demonstrate our qualities as statesmen and true daughters and sons of Africa. 13. I thank you for your kind attention.